Our unique birthday parties on the farm are great fun for all ages and a great way to celebrate a special occasion. Your child’s birthday party will be one that they and all their friends will always remember. Our farm park facilities mean that whatever time of year, whatever the weather, they can enjoy a real countryside experience to celebrate their special day. We have 3 great themed party packages to choose from (detailed below), each includes your own Farm Park host and choice of menu (a choice of hot or cold food, freshly prepared on the day) including ice cream and jugs of juice. HOT - Sausage, fish fingers, pizza or chicken nuggets. Served with chips and beans. COLD - Sandwiches, mini sausage, pizza, crisps and a selection of biscuits. This fun package allows your little ones to play to their hearts content with admission to the farm park. You will have plenty of time to feed the animals with a free bag of food each and to explore the adventure playground. This package is for the creative ones amongst you. Choose a ceramic pot and turn it into your very own masterpiece. With admission to the farm park, adventure playground and a free bag of food each there will be plenty to keep your little ones amused. Up close with the animals is the theme of this party. 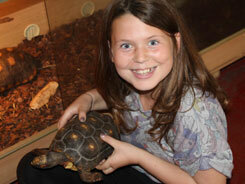 Meet a selection of our animals with this hands on experience. You will have admission to the farm park and a bag of food each to feed the animals . There will be plenty of time to play on the adventure playground with all your guests!! To reserve a date for your party or enquire about food choice and availability, please telephone us on 01244 301473. 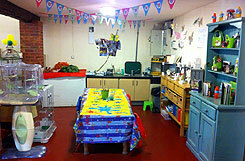 We can cater for any number of children per party, just let us know the quantity when you book. A non-refundable deposit of 50% is required to secure your booking. All children will be charged for unless 24 hrs cancellation notice is given. If you have any questions or would like to book, please call 01244 301473. Download and print your children's party invitations here!